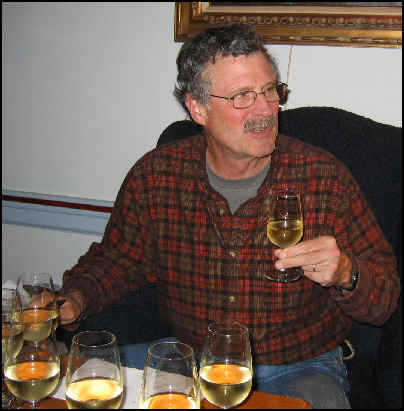 Vino Fino host John McGlothlin wanted to survey some French Chablis wines and so he surprised the group by omitting such esteemed Chablis producers as E & J Gallo, Almaden, Inglenook, Carlo Rossi, etc. 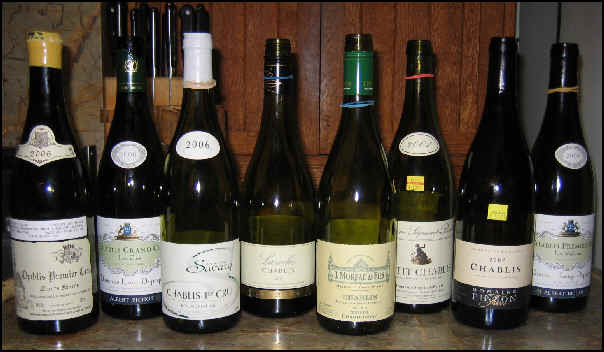 We assembled a range of Chablis wines...including some large firms along with the "cult" domaine of Raveneau. 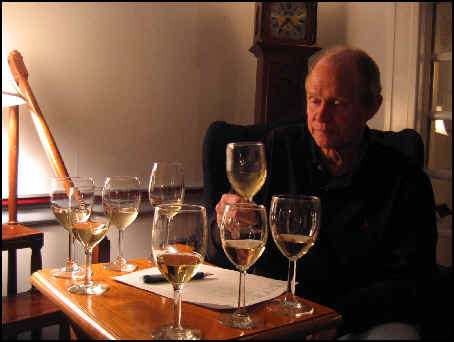 The wines were from the 2006 and 2007 vintages. 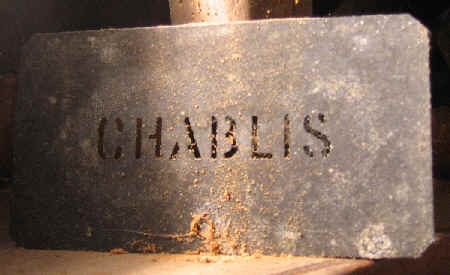 A "Petite Chablis," from a plateau near the village of Chablis, was included, along with simple "Chablis" and some premier cru and Grand Cru level wines. There was quite a range in terms of price. 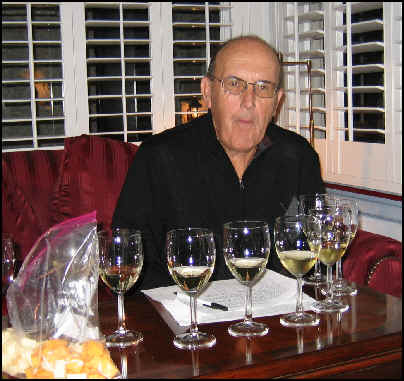 Two wines set the pace, followed by third to sixth place and then our two also-rans. 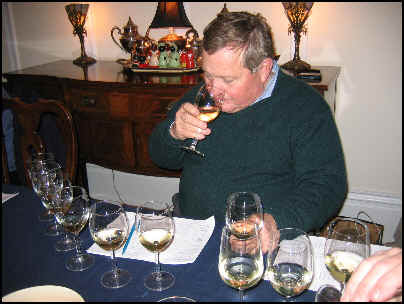 Overall, however, the quality of the wines was quite high and many tasters were delighted to find the lowest-priced wine to be, actually, very nice and quite drinkable. Clear in appearance and with medium straw color, the nose of this wine was rather shy. It was faintly vinous, but quite undeveloped or empty at this stage. Dry and nicely acidic, the wine was more expressive on the palate...it showed crisp apple-like fruit with a mildly stony element. I gave it one-and-a-half stars on my three star scale (no stars being average). Typical Chablis. Medium-light straw in color and with good clarity, this wine started off with a hint of a mushroomy note on the nose which made it slightly less appealing to me. If one becomes desensitized to this note, there's a classic stony/wet rock-like quality on the nose. It's tart and dry and light in body. I described it as "wiry and lean." Crisp...a good example of simple Chablis. One star. Despite having less "pedigree" than the other wines in the tasting, this was an impressive little wine. Light straw in color, it is brilliantly clear in appearance. Stony and chalky notes are displayed on the nose...quite typical of Chablis. It's dry and tart...light in body. On the palate this is lean, classic, tangy and a perfect seafood white wine. One star. Clear in appearance, the nose of this offered nice, stony notes with a bit of green apple fruit. 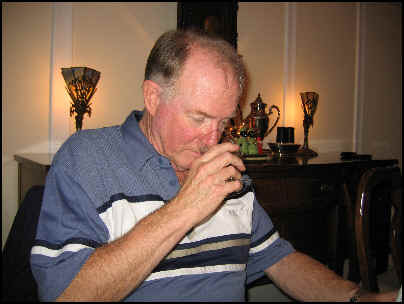 There was a lightly smoky aspect to the aromas, as well. It's dry and nicely acidic. Medium-bodied, the flavors showed the apple fruit along with a pear-like element. Quite good...classically styled Chablis. One-and-a-half stars. Medium straw in color and quite clear in appearance, this wine featured a lightly citrusy fragrance. There was a faint suggestion of grapefruit on the nose and a lightly buttery element, too. Dry and tart, this was medium-light in body. Tangy, zesty and simple on the palate...classic. One star. 3rd Place: SAVARY 2006 CHABLIS 1er Cru "Fourchaume"
Light straw in color, the wine was quite clear in appearance. I detected a lightly chalky note on the nose along with some stony elements. It's a medium-bodied, dry white. My lack of enthusiasm for this wine centered on a candied note on the palate...One half of a star, I suppose. Clear in appearance and with medium straw color, this was one of the two show-stoppers in the tasting. Though the wine is clearly matured in wood, the oak plays the role of adding "seasoning" to the wine, not taking center stage. There's a light vanillin element here, but also notes of white flowers and a touch of stony, chalky tones. Quite good on the nose. Dry and with a medium-high level of acidity...medium+ bodied, too. Compared to the simple, basic Chablis wines, this is "grand" White Burgundy. 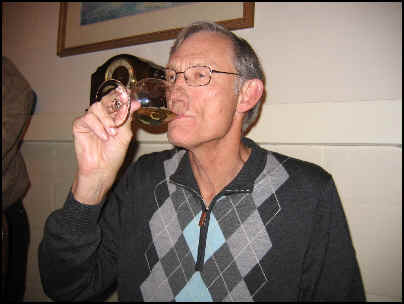 It's nicely tart on the palate with a bit of wood...crisp...very fine. Two stars. I'd expect this to continue to develop and blossom with 5-10 more years of cellaring. Medium straw color and clear in appearance, this wine, like the 2nd Place finisher, shows evidence of having been barrel aged. There's a nicely woodsy aspect to the nose, with lovely stony notes and a minerally streak. Dry, moderately tart and medium+ bodied, the wine is impressive on the palate. Crisp and nicely intense...like the Les Clos bottling (above), it's more similar to grand White Burgundy wines than it is "simple" Chablis. Very fine. Two stars. Another wine which can be cellared.